with residents in the summer. Why not explore the unique services provided at Sharston House, designed to make your or your loved one’s stay a pleasurable experience? Do not worry if you cannot find what you are looking for; you can contact the home by telephone or email. We will be more than happy to help you with any question that you may have regarding care for the elderly. Sharston House is a real home from home for the staff as well as residents. Energetic activities co-ordinator Stacey ensures that residents have a fun time with a range of stimulating activities from “knit and natter” and “boys club” afternoons to flower arranging and arts and crafts. Sharston House loves to be at the heart of the community and regularly welcomes visitors from school and church choirs to hairdressers, entertainers, a chiropodist and a keep fit lady. A diagnosis of dementia brings with it a very difficult and confusing time for the individual and their loved ones, and it is only natural to feel anxious about moving somewhere new. At Sharston we ensure that the transition into our care is carefully assessed and managed in order to minimise upset to all concerned. Residents who are experiencing memory loss benefit from our enlightened approach to dementia care, which stimulates, supports and comforts in a safe and homely environment. We are committed to providing the best possible outcomes for these residents, and we achieve this through our ‘Wings’ (Welcome, Individuality, Nurturing, Guidance, Sensitivity) philosophy of care. This award-winning approach is nationally recognized and our bespoke learning programme is designed to ensure that the person with a dementia is at the heart of everything we do. Whether it’s a friendly face, a warm smile or taking time to listen, making a positive difference to someone’s day is what makes our world go round. As with all Kingsley homes, there are regular visits from hairdressers, chiropodists and holistic therapists. There is also an active entertainment programme for those who wish to participate, yoga sessions, music afternoons, craft, trips out and visiting professional entertainers. These activities are offered on a one to one or a group basis. We place great importance on the lives our residents have led before coming to us. We spend time with them and family members to find out about their tastes, history, hobbies and interests. We see family and friends as our partners in caring for the individual and we welcome feedback and suggestions at all times. The information shared helps us to create individual care plans that are crucial in providing the best care and help us get to know the individual. Residents are helped to achieve their aims by taking part in meetings, surveys and one-to-ones. The home is continually committed to specialist training, which enables staff to help individuals express their needs and maintain a high level of independence, self-worth and well-being. We welcome and encourage our residents to make their rooms as homely and personalised as possible. By furnishing the room with their own belongings they create a space in which they can feel safe and happy. Paintings, a favourite ornament and plenty of family photographs can all be of comfort and will help if a resident feels unsettled. We encourage all our residents to live as healthily as possible, to help them have long and pleasant lives. We encourage appropriate exercise, keeping minds active and eating nutritious food, and our healthy, balanced meals are made from scratch using only the best, locally sourced ingredients. We understand that people’s tastes and habits are different, and we ensure that the varied menu includes a selection of nutritious delights and individuals’ favourites. Each Kingsley care home is unique but all have a set of highly respected and award-winning features embedded within the culture. Our daily emphasis is on the care that our residents need, whether that is physical, emotional or spiritual. “Thank you for your kindness and loving care given to our mum. Life has been hard for her but during her stay with you, no longer is she lonely.” Kingsley resident’s relative. Big or small, whatever your concern may be, please do not hesitate to contact us at any time regarding any care matter. We will be happy to help you find the right care and the necessary support that you may require. Sharston House is situated in one of Knutsford’s most pleasant locations, less than half a mile from the pretty town centre conservation area and with good road and rail links. The 48-bedroom home is an interesting combination of an old Victorian building with many original architectural details coupled with additional more recent bedrooms. The majority of rooms have ensuite facilities with many on the ground floor having patio door access to the garden. Residents are encouraged to personalise their rooms. There is a large dining room and many relaxed sitting areas with televisions. Our chef uses fresh, local produce to create tempting daily dishes; kitchen staff are pleased to accommodate individual tastes and any special dietary requirements. 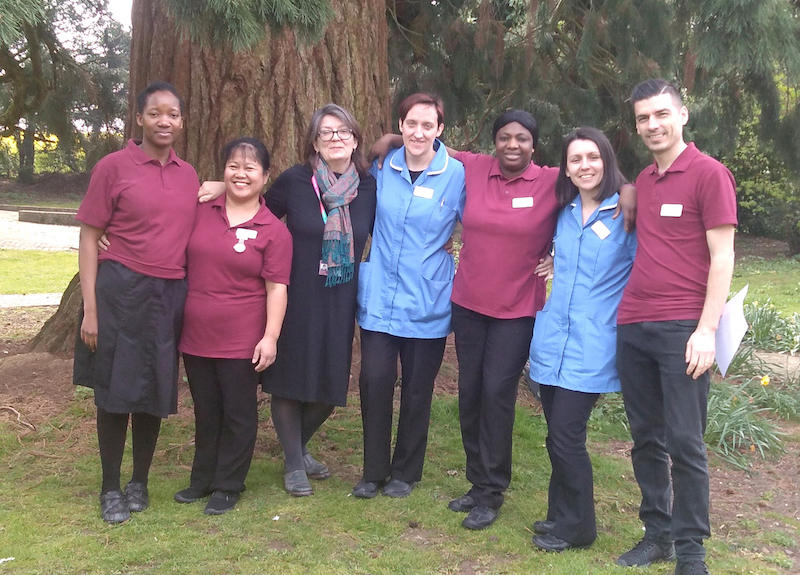 The care team at Sharston are specifically selected to meet the criteria of a person-centred worker, and undergo a continuous programme of training, on both practical and theoretical levels. Most of our training is facilitated by our own training arm, Kingsley Academy. We celebrate all the usual annual festivities, national holidays, birthdays, anniversaries and unique special occasions and encourage all residents and their families to participate if they wish. We also have an ongoing programme of entertainment, such as an Elvis impersonator and other singers coming regularly, garden parties throughout the year and someone coming in to give hand and foot massages, which the residents love. We also organise trips out to local areas for those able to join us. Easter Family Fun Day 2-4pm..
Methodist Church Easter performance 2.30pm..
Elvis is in the building! 2.30pm..
St Cross Holy Communion 2.30pm..
Mother’s Day Afternoon Tea with Richard Hazlewood – booking essential – 3.30pm..
Deborah McCormick – Irish Sing-Along 2.30pm.. Guest speaker from Elizabeth Gaskell Society 2.30pm..
St Vincent’s Pre School visit and pancake Challenge..
Coffee morning – hosted by Red Cross..
Anthony Lye singer – 2.30pm.. Afternoon tea for two – loved one or friend for Valentine’s day..
St Vincent’s Pre School visit 1.30pm..
Scottish themed day for burns night – Knutsford Scottish Country Dance Group performing 2.30pm..
ZooLab Chinese New Year theme 3pm..
St Vincent’s Pre-School visit 1.30pm..
St Cross Holy Communion 2.30 pm..
Talk on rogue traders and distraction burglaries – and how to avoid them at Sharston House Nursing Home, in Manor Park South, Knutsfo..
Teddy Bears’ Picnic – St Vincent’s Pre-School 1.30pm..
MacMillan Coffee Morning – with Charlotte MacMillan nurse and having a Sharston Bake Off where residents and Charlotte will taste and rate..
Sam Mitchell singer 40’s theme – 2.30pm..
St Cross Holy Communion - 2.30pm..
Anthony Lye singer - 2pm..
Coffee Morning – Sara Jones NAMASTE 10.30am –noon..
Bethan Thomas singer - 2.45pm..
St Cross Holy Communion - 2pm..
Joe Cainen singer - 2pm..
Join Sharston House for the Alice in Wonderland Mad Hatters Tea Party. Sunday 30th September at 2pm - 4.30pmGiant games, tombola, sweet stal.. The support that the charity Age UK provides for older people will be the subject of a talk at Sharston House nursing home, in Manor Park So..
Elisabeth – Violin music session at 2:30 pm onwards.. Guest speaker is John Knowles from Knutsford and District Stroke Association. Talking about what the association does and what to do if some.. Event Day - Day at the Races..
Free open afternoon at Sharston House Nursing Home in Knutsford. 2pm to 4pm on Saturday June 23. Special guest Steve Coppell. The former Man..
Coffee morning - Speaker tea..
Sharston's House nursing home Christmas Light Switch on event at 1st December 5-7pmWelcome drink on arrival, Hot pot and mulled d..
A display revealing the colourful history of one of Knutsford’s most prominent homes will go on show during a Victorian fair and street pa..
We realise that the move to a care setting can be a challenging time for those moving and their relatives, and we want to help make this process as streamlined and stress-free as possible. Please feel free to contact the home for any information or advice on care for the elderly, and if we cannot help you we will redirect you to the best source. Alternatively you can use our online form, and we’ll get back to you as soon as we can.